Water-fed cooking equipment uses steam for cooking, proofing, or glazing food products. All have one thing in common, they evaporate water by heating it to produce steam and this process leads to mineral scale formation. Mineral scale build up on heat transfer surfaces from hard water. Mineral scale build up on level sensing probes. Chlorine/Chloramine induced corrosion in boiler / cooking cavity. Chloride induced corrosion in cooking cavity all leading to costly equipment repairs and reduced equipment life. Many factors must be considered when choosing water filtration/treatment for steam equipment. Water quality, equipment design and intended usage must be known to correctly apply proper water filtration/treatment. Evaporation – Where do the minerals go? When water is heated and evaporated, the dissolved minerals must go somewhere. In boiler-based equipment, the dissolved minerals stay behind in the boiler. As steam is produced, the mineral content in the boiler increases along with mineral scale formation. In flash steam / boiler-less applications, the dissolved minerals will either immediately precipitate out of solution as tiny particles or remain in solution in the water vapor, steam or condensate thus coming in contact with the stainless steel cooking cavity and its components often leading to corrosion. 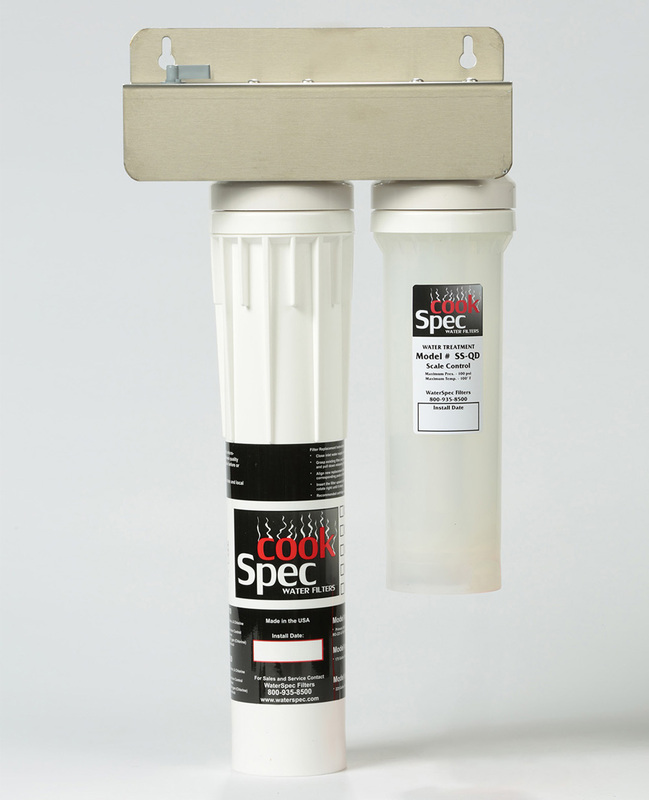 CookSpec™ Water Treatment Systems for use in boiler based systems rely on the proven HydroBlend™ technology. Sequestering scale-causing minerals keeping them in solution. Changing the shape of the precipitated scale-causing mineral so it does not have the ability to build up on itself. Softening existing scale allowing it to be flushed from the system. CookSpec™ water treatment systems also provide chlorine removal for the prevention of chlorine induced corrosion in the boiler. CookSpec filters provide excellent sediment filtration, chlorine removal and mineral scale control. 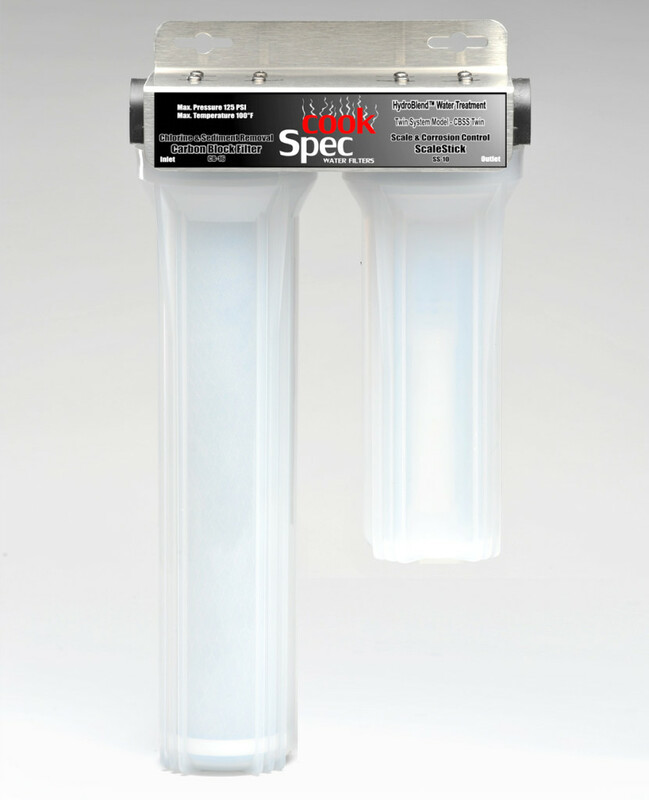 The gallon capacity ratings of the filters are based solely on chlorine removal and not sediment removal or scale control. Recommended filter change interval is 6 months. Many recent combination oven designs use flash steam technology. Flash steam is the process where water is sprayed or introduced in small amounts to hot environments instantly flashing or converting the water to steam. This design eliminates the need of a boiler. The main draw back to this design is that the dissolved minerals are in direct contact with the stainless steel components which is a cause for concern due to mineral scale deposits and corrosion potential. Although mineral scale is a concern in flash steam equipment, these deposits are accessible for removal during cleaning cycles, either automatic cleaning during hours of use or at the end of the day when the equipment is cycled off. Of more concern is the corrosion potential from chlorine, chloramine, and chlorides found in many water supplies. Although filtration exists that will remove, chlorine and chloramine, there is only one viable technology for use in food service applications that will address both chlorine and chlorides – Reverse Osmosis. Reverse Osmosis (RO) is the process by which most if not all dissolved minerals are removed from the water by filtering it through special membranes designed to reject most water impurities. 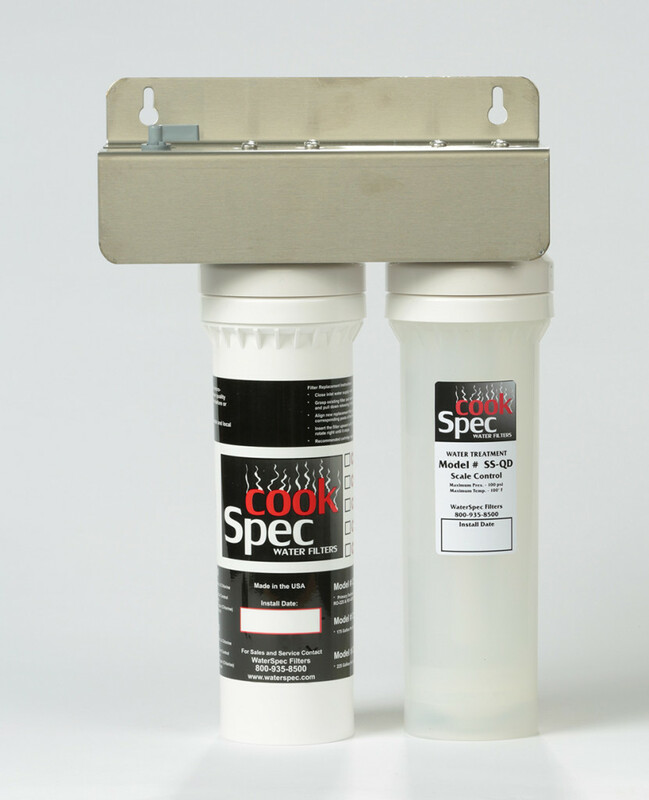 CookSpec RO systems are specifically designed to meet the needs of boiler and boiler-less cooking equipment where both mineral scale deposits and equipment corrosion are a concern. Chlorine and chloramine responsible for corrosion of wetted stainless components. Chloride which also causes pitting and corrosion in wetted stainless components. 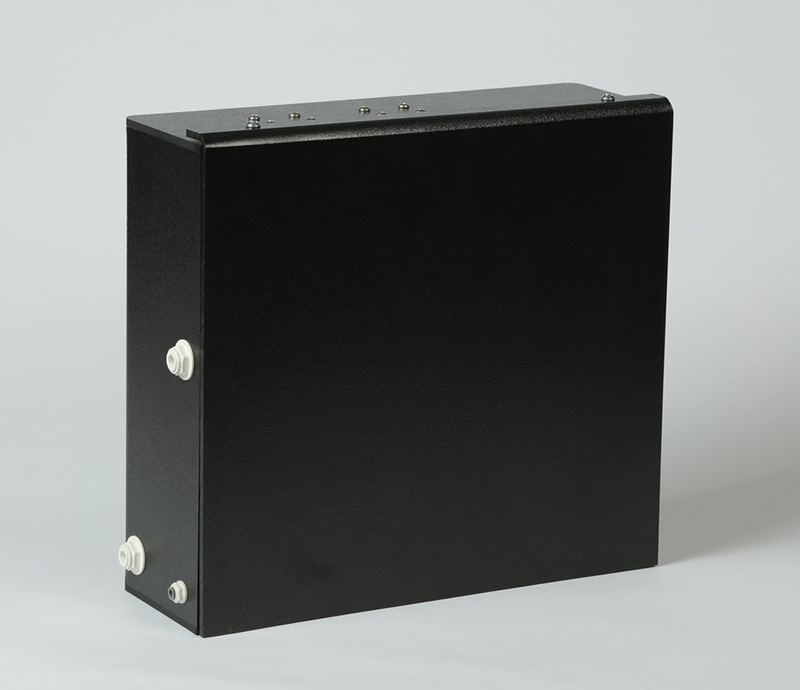 Clean cabinet design either wall mounted or stand alone with “plug & play” bulkhead connections. Small space requirements facilitating placement and installation. Non-electric operation allowing placement flexibility. Integrated TDS Meter for system performance checks. High Volume RO water production. Quick Disconnect Cartridges for ease of maintenance. 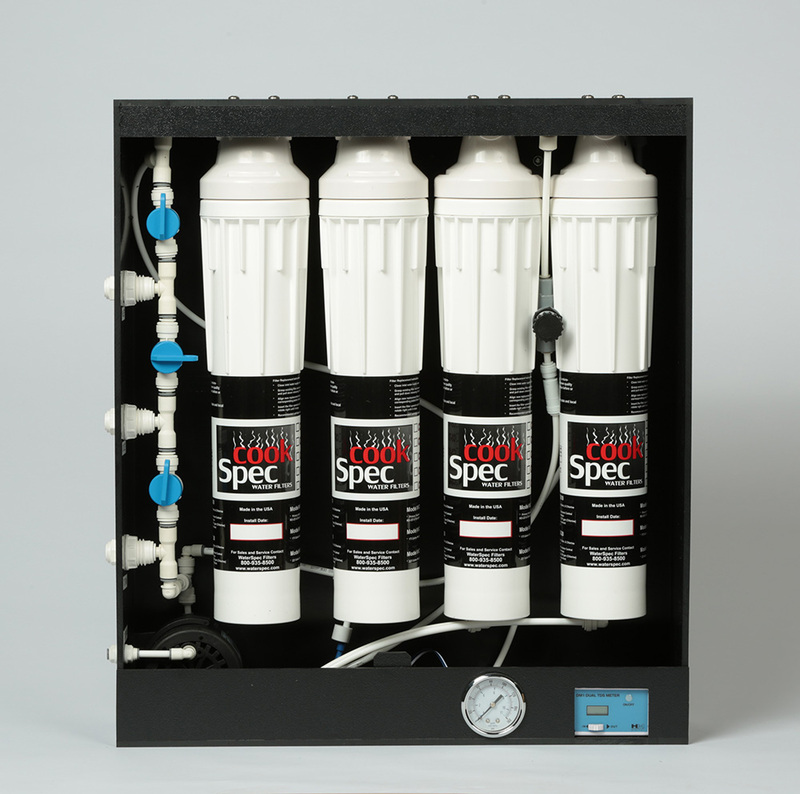 CookSpec™ RO Systems provide excellent quality water for specialty equipment requirements. The following system performance parameters are based on water pressure at 60psi and water temperature at 60°F. Higher water pressure and water temperature will increase performance. Conversely, lower water pressure and temperature will decrease performance. Recommended pre-filter change interval is 3 months. Recommended RO Membrane replacement interval is 12 months. Note: If pressure exceeds 80 psi, use a pressure regulator prior to the system avoiding possible damage to the product water storage tank. If pressure is below 40 psi, and external booster pump may be needed in order to produce the needed quantity of product water. 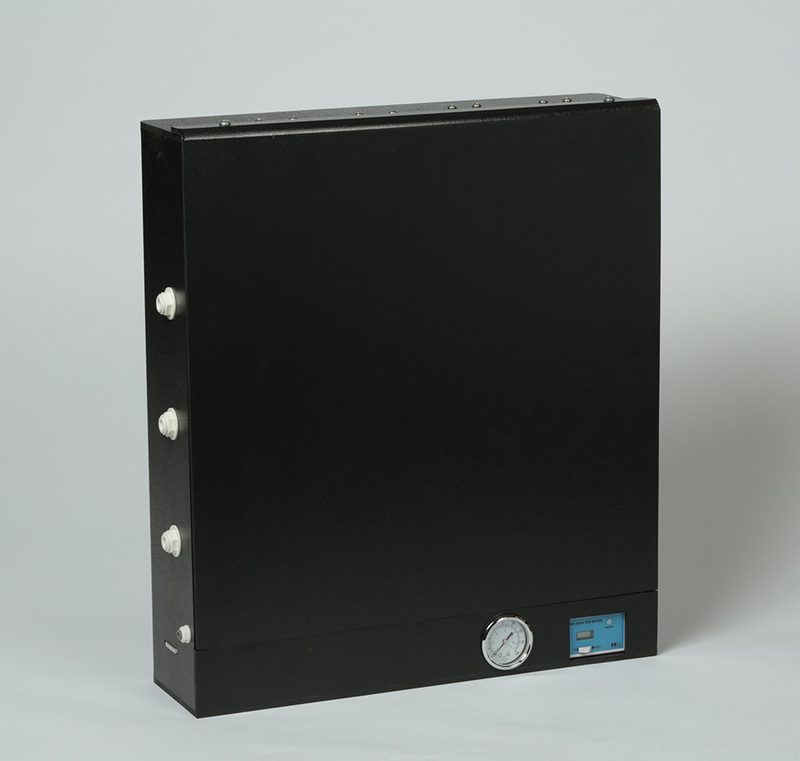 The CookSpec™ RO-175NE is specifically designed for low water demand applications such as flash steam (boilerless) combination ovens. The RO-175NE incorporates a small product water storage tank capable of delivering roughly 32 ounces of on demand water. The RO-175NE is capable of producing 7.25 gallons of water per hour allowing the storage tank to refill in 2-3 minutes. If higher on demand water volumes are required, an external storage tank may be installed to accommodate water usage requirements. 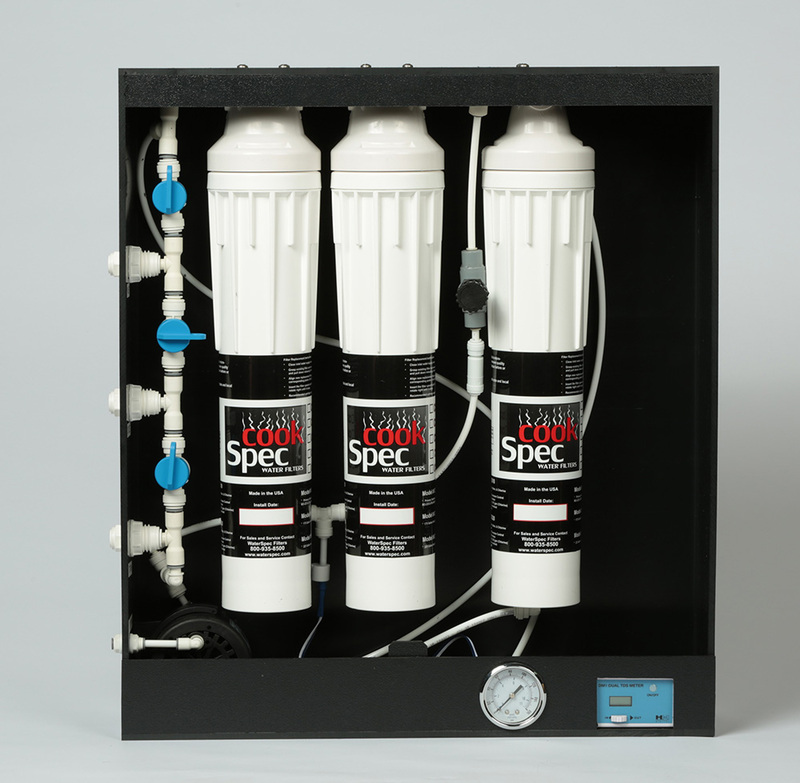 The CookSpec™ RO-250NE provides 10.25 gallons per hour of high-quaility water for both boiler based and boiler-less water treatment equipment including steamers, combination ovens, deck ovens, rack ovens and proofers. The system features integrated TDS meter, TDS bleed valve, panel mounted pressure gauge and internal bypass valve system. 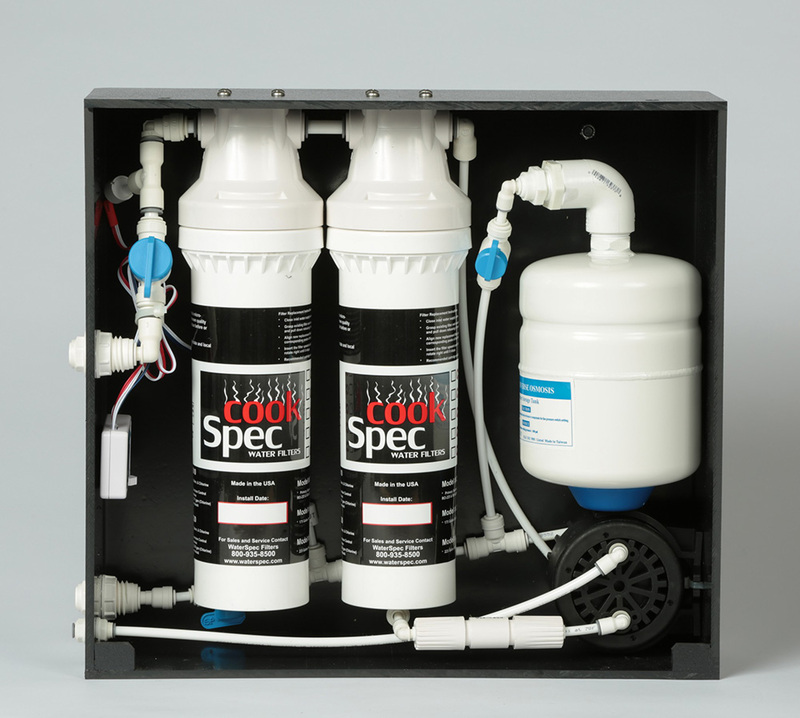 Similar to the RO-250NE, the CookSpec™ RO-450NE adds an additional membrane increasing high-quality water production to 18.75 gallons per hour. Both the RO-250NE and RO-450NE feature quick disconnect filter cartridges and “plug and play” bulk head fitting connections simplifying installation and scheduled maintenance. 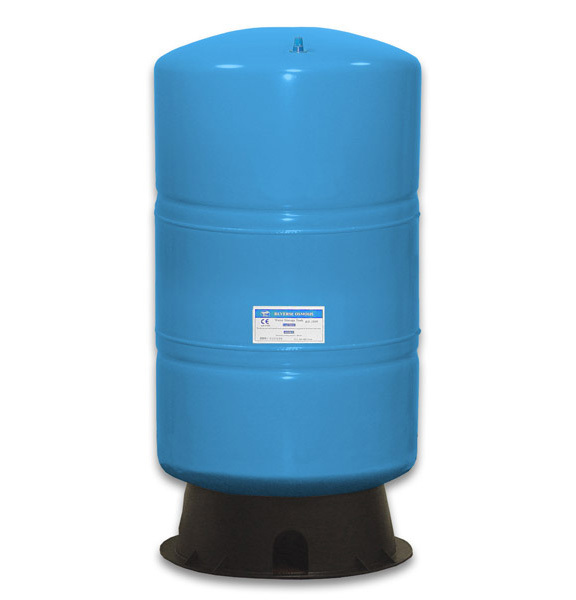 Both the RO-250NE and RO-450NE systems require external product water storage tanks. The standard tank is a 20 gallon tank with a total on demand volume (draw down) of 13 gallons at an incoming pressure of 60psi. Refer to the parts list for additional tank options.